Thanks to everyone who particpated! It was great reading all of your comments. I plan to do another one on April 24th in celebration of my 34th (YIKES! 34!!!!!!!) birthday :-). Thanks to everyone who left such sweet comments! 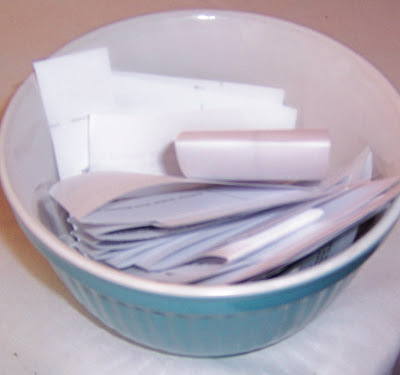 I have printed them all out, and tomorrow, I'll have my daughter draw a name. I'll announce the prize winner tomorrow night. I also would like to encourage everyone to check in and visit the lovely and talented Debra Schoch from Hop Hop Jingle Boo, who has recently started a new blog !!! Her work is just awe inspiring! Please join me in wishing her a warm welcome to blog land! I am so overwhelmed, and so grateful to all of you for the beautiful, heartwarming and encouraging comments that were left about Alice. She was so much fun to create, and will be difficult to part with when she goes up for sale on Glitter and Grunge next month. 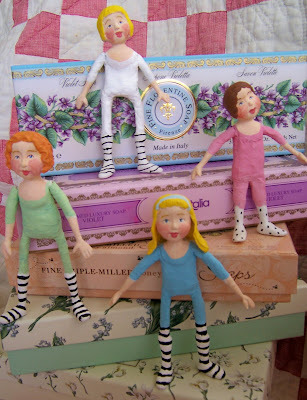 Made in the same way that Alice was completed, these miniature scale dolls have hand sculpted heads, hands and legs. Features were sculpted in paper clay over wire and foil armatures, which were wrapped in paper tape. Before painting with acrylic washes, they were each gessoed, and then sealed and antiqued after painting. Inspired by early 20th century children's dresses, their little costumes were created from layer upon layer of cupcake liners and ribbon, and their removable hats were fashioned from scrapbook paper and ephemera. The removable wings were copied from vintage images of butterflies. After sealing and wiring for strength, the butterfly wings were also sealed and glittered for a vintage sparkle. 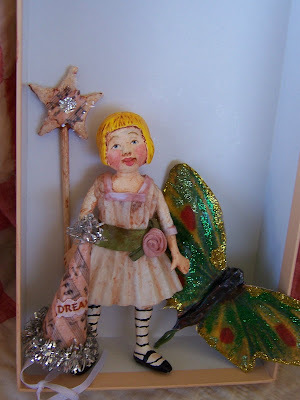 I wanted these little fairies to reflect the vast imagination that we all had as children. 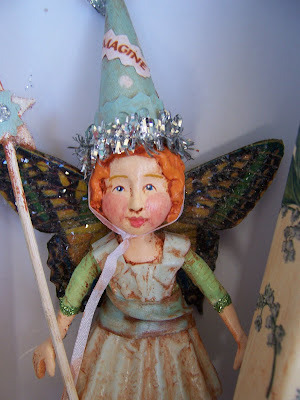 Those days when a handmade paper hat, and a wand fashioned from cardboard, tape and an old broom handle became as real to you as any fairytale princess's wand would. 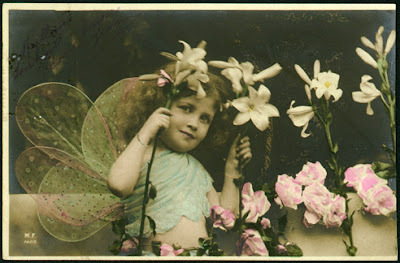 I absolutely adore what collage artists are doing with vintage photographs of children, butterfly ephemera and glitter. These small pieces were thoroughly inspired by them. 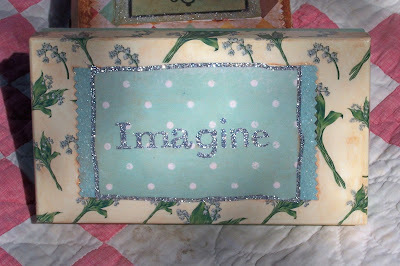 The fairies various boxes were crafted from old fancy soap boxes, scrapbook paper, paint and glittery silver lettering. 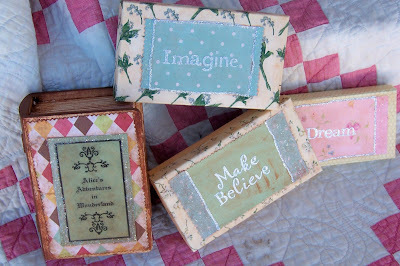 These were such fun projects. Over this past weekend I have already started on a few more. The new ones will eventually become a Red Riding Hood, a Goldilocks (and 3 bears of course) and a Little Bo Peep. For inspiration, I have been raiding the Antiquarian and Collectible Book categories at Ebay, and thanks to some auction wins, will be adding some pre 1920's fairy tale, fable and Mother Goose books to my small vintage children's books collection. 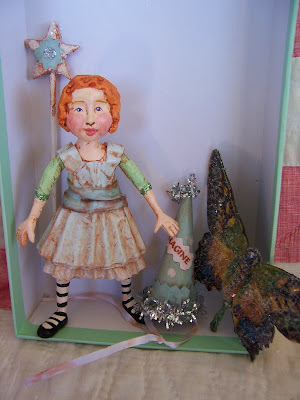 The Alice doll and the "Imagine" Fairy (the redheaded one) will be offered up for sale on the Glitter and Grunge website, beginning April 1. 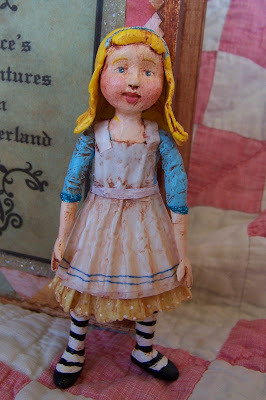 The blond haired fairy as well as some other storybook dolls that will be in the works this weekend will be available for purchase on PFATT Marketplace starting April 10. 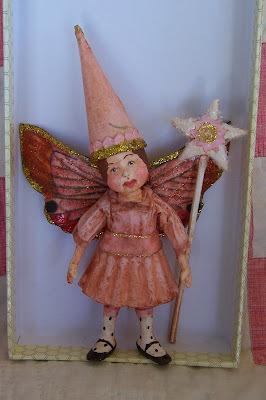 And as a thank you to all of the support and encouragement that you all have given me over the past few months, the wee pink one, otherwise known as "Dream" fairy, will be given away to a commenter (comments on this post) whose name I will draw next Sunday night, March 25. I do moderate comments, so don't worry if your comment doesn't pop up right away. As many of you guessed, the little doll in blue was destined to become a mini version of the ever so curious heroine from Lewis Carroll's classic Alice in Wonderland. 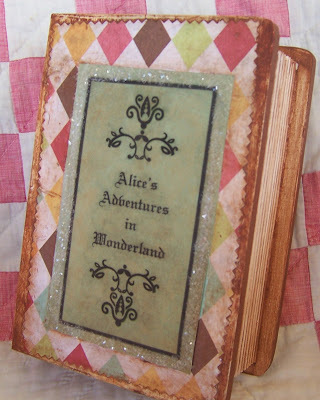 A good friend of mine has loved this book so much since childhood, that she has always kept an "Alice" corner in her home. 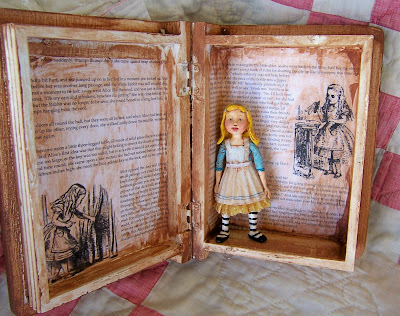 It's filled with many versions of the book (not sure...but, I think she may even have a first edition in there...), figurines, and another little Alice doll that I made for her a few years back. This tiny version is dollhouse scale, with features sculpted from paper clay, over a wire, foil and foam armature that was wrapped in paper tape, gessoed, painted, sealed and antiqued. I have never been very good with fabric, so this little one's costume was constructed entirely of cupcake liners! The dress is nice and sturdy thanks to a 3 to 4 step process that I go through to create the clothing. There are tons of interpretations of "Alice", from Sir John Tenniel and Arthur Rackham and of course, Walt Disney. I was mostly inspired to create a Tenniel-esque version (although in his version, Alice didn't have stripey socks until she went Through the Looking Glass). Now of course Alice would be way too lonely in the altered styled book box all by herself, so I created the little white rabbit, a tea pot, and the "drink me" bottle to keep her company. 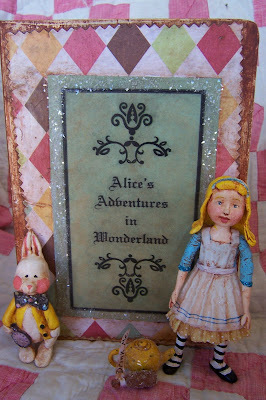 Pages of the story itself were decoupaged to the inside of the book. You can see how comfortably she fits in there ! I hope everyone enjoys looking at my finished Alice! I had so much fun with this one. My full time job has been so crazy lately...but I find creating and crafting, especially doll making, to be so therapeutic. I truly believe that it's one of the best stress busters and mood lifters out there! 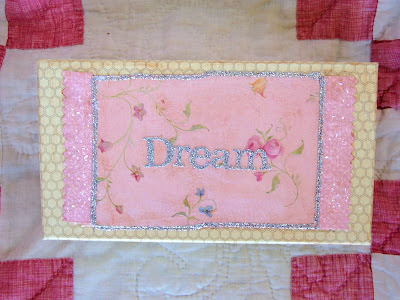 I think it's important to set aside time for yourself each day nurturing your creativity and pursuing your dreams. Even if it's only a 1/2 hour. It's like a workout for the mind. And we all need more exercise, right? 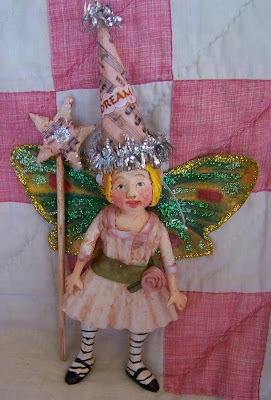 Next post I will be sharing pictures of more finished dolls. Thank you so much for all of your encouragement and comments! So much loveliness to share!!! 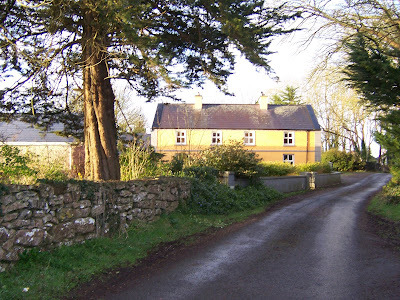 This post will mostly be all about the pictures! 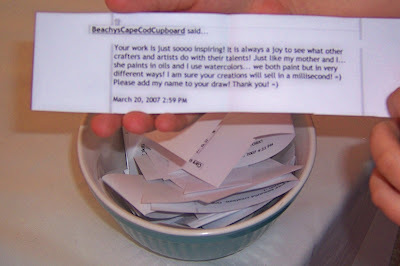 My mailbox has been overflowing with goodness from the talented hands of fellow bloggers and friends! Some was purchased, some was swapped. All of it is WONDERFUL!!! 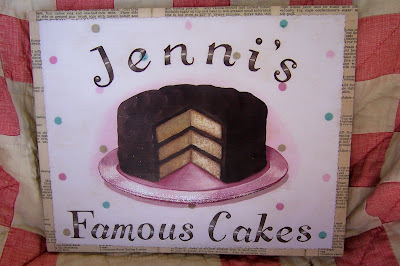 My good friend (another Jenni who lives on Vashon Island in Washington and is an awesome cake baker) will be the lucky recipient of this gorgeous personalized piece. She will love it!!! I am so tempted to keep it for myself.. but I do spell my name with a "y"! This cake looks so real... you can practically take it off the plate! Incredible!!!! You MUST check out all the goodness in their Ebay shop. Your jaw will drop! Your mouth will water! You will want to get one of everything they make!!! 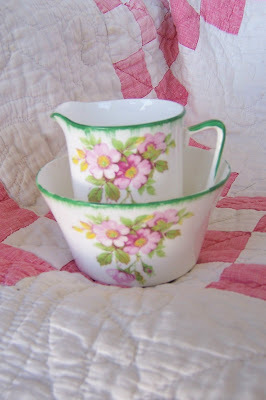 Next I had the pleasure of purchasing the lovely jug and bowl set below from Clare at her newly opened Vintage Home webshop. 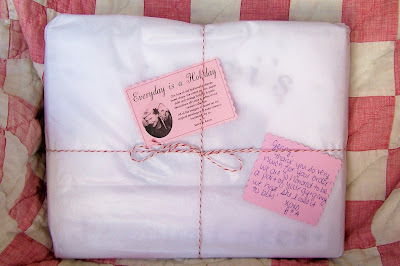 It traveled safely here all the way from her home in England (and so quickly too!) . 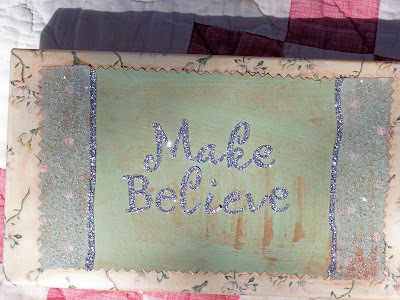 It's so pretty resting on the window sill of my shabby chic inspired bedroom. I'll take some pics of that soon! Speaking of treasures from England...check out the stunning postcards purchased from Nikki's Nostalgia at the Stone House webshop. The detail on these amazing cards is unbelievably cool. 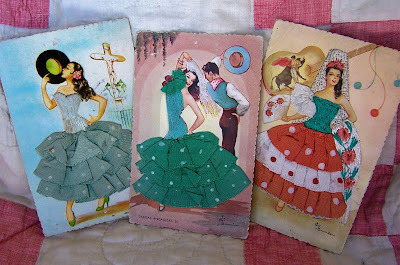 My favorite sister in law, who is of Spanish descent, will absolutely adore these when she receives them for her birthday in a few months. I am considering framing them in a shadow box...opinions? After seeing the sweet creations on Little Lovelies blog, I had to have this awesomely cute brooch from her Etsy shop. 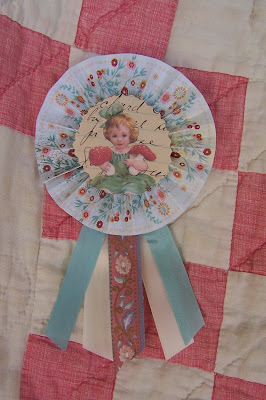 Just looking at this piece makes me smile..
And another gorgeous brooch, from the hands of the talented Artsy Mama . I was lucky enough to acquire this hand crafted beauty in a swap. So pretty!!!! 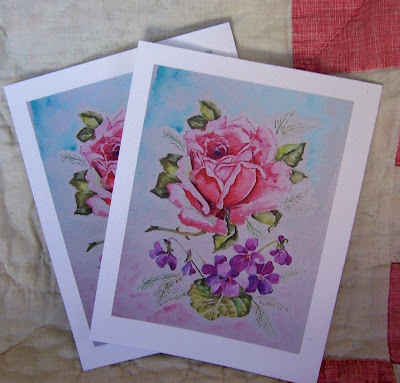 Speaking of talented hands... can you believe how gorgeous these watercolor print cards from Beachy's Cape Card Cupboard's Esty shop are! My favorite flowers... Violets and Roses, rendered so beautifully. I am amazed, and am so blessed to be in the company of such talented women. You all really inspire me! 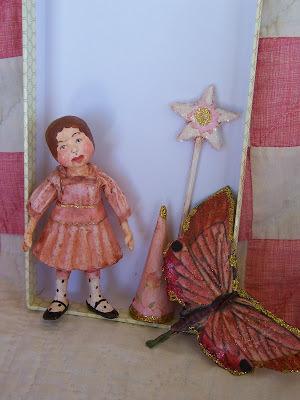 You have all been so sweet to leave so many encouraging comments about the mini dolls posted last week. You may be wondering what ever happened to them... pics are coming soon! In a meanwhile.. here's a hint....stay tuned!!! Whew! Work has kept me busy, so almost a week now since my last post! 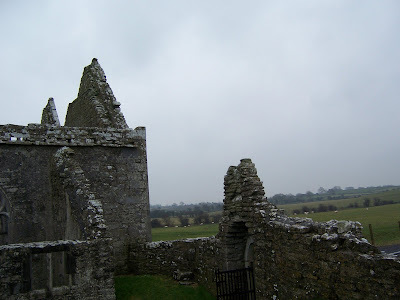 Thanks again to everyone who left such nice comments about my Ireland pictures! Here are are some more to get you ready for St. Patrick's day! 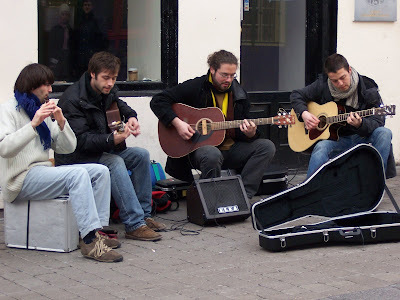 Below is a picture of some wonderful Irish musicians performing on the streets of Galway. In Dublin, we stayed in Bewley's Hotel. 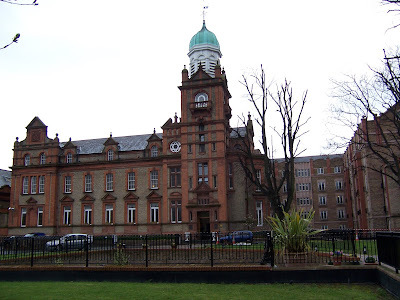 Such a lovely old building located in the residential Dublin neighborhood of Ballsbridge. Converted into a hotel from an old masonic school, you'd never guess that the interior decor was sparse, modern, and light. At only 99 euro per night (for all four of us!) , we didn't care what the style of furnishing was! 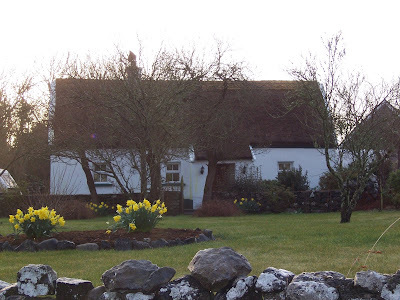 Another view of the holiday cottage we stayed in County Galway... this pic really makes me homesick for the place. After breakfast in the mornings there, the weather was usually fine, so I'd take a short, happy walk through the area, and sigh and sigh at all the moss and ivy growing like mad over anything standing still . No trip to Dublin is complete without a trip to Guinness! 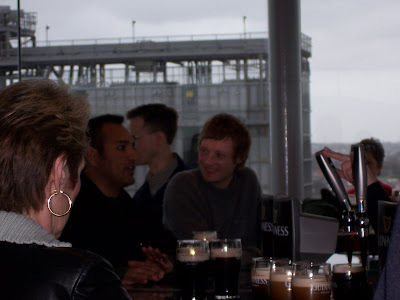 Below, a pic of my husband (the dark one) having a pint with a local on the observation level of that famous brewery. Since we don't want to let our passports get too dusty, we're beginning to talk about where to head next. My sunshine loving husband would love to head south to Brazil or Argentina. If I have my way, we'll be heading north to Canada (to see Nova Scotia and P.E.I. of course!) , or crossing the pond yet again to take in Scotland, England and Wales. I am sure there must be a compromise in there somewhere right?